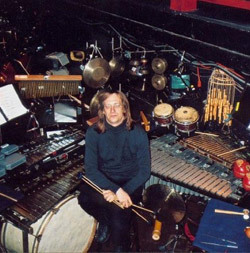 Paul Hansen has been active as one of the top percussionists in Seattle's music and theater circles for 30 years, with over 90 musicals to his credit, including the World Premiere engagements of 'Hairspray, Shrek, Young Fankenstein and Catch Me If You Can." Paul is also featured in many jingles, film and video game soundtracks. He has also performed and toured with many popular talents such as Johnny Mathis, Quincy Jones, Mr. Rogers, and Burt Bachrach to name just a few. As a concert musician he performs regularly with the Seattle Symphony Orchestra, the Pacific Northwest Ballet and Auburn Symphony. His Concerto for Percussion and Orchestra was premiered by the Northwest Sinfonia, with Paul as soloist in 2002. Paul also serves as Managing Editor for Freehand Music Publishing, and is co-founder of the Pacific Rims Percussion Quartet.